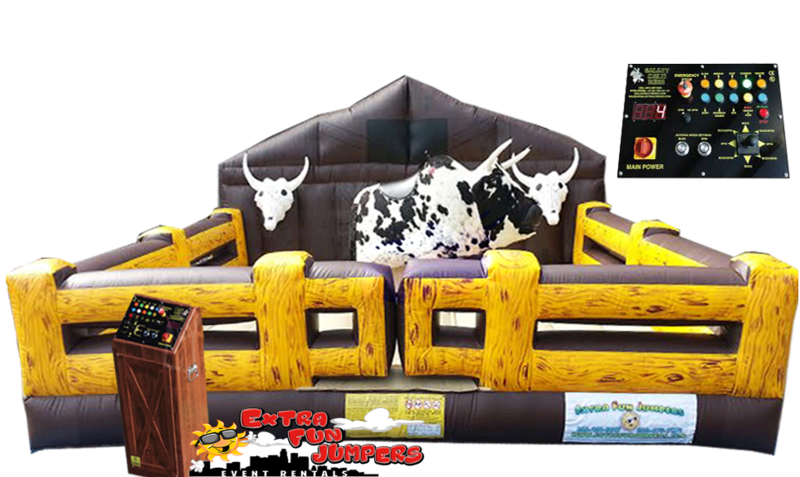 Rent the mechanical bull for your next church function, birthday party, corporate event or special event. This is a serious challenge, testing your ability to ride just like the cowboys. Safe enough for children, tough enough for professional bull riders ! The mechanical bull simulator is more than just a ride, It's an experience filled with realistic rodeo action. See if you can survive the bull's wrath for the full 8 second challenge the real rodeo kings are subjected to. We can not take this unit up or down any "Stairs" or "hills"
1. Release Of Liability And Assumption Of Risk. sign by a parent or legal guardiant on the day of the event. 2. A maximum of one participant with a minimum height of 48'' is permitted on mechanical Bull. 3. Remove shoes, eyeglasses, and loose fitting jewelry prior to participation. 4. Participants must obey instructions provided by attendant operating this attraction. 5. Food, beverages, or chewing gum is not permitted during participation. 6. No persons permitted to participate in game without Adult Supervision. 7. Spectators should not sit or lean on game while observing and should remain a minimum of three (3) feet back away from inflatable amusement device.